Continue reading Come one come all to the WBF Show! In the first of a three part series, we look at the brief life of the World Bodybuilding Federation, an organisation financed by wrestling mogul Vince McMahon that tried to take on Joe Weider’s formidable stronghold on the sport. While the WBF ultimately failed, its influence on the sport cannot be underestimated. Bodybuilding is an interesting sport in more ways than one. Aside from the bulging muscles, oiled behemoths and flashy lights, there exists a fascinating business element to the sport. For the greater part of the 20th and 21st century, bodybuilding has been ruled and prescided over by the International Federation of Bodybuilding, the IFBB. Every major professional bodybuilding tournament boasts the IFBB logo and many of the greatest bodybuilders from Arnie to Ronnie have cut their teeth in the organisation. Created by Joe and Ben Weider, the IFBB spent the mid half of the 20th century fighting off and finally defeating Bob Hoffman’s AAU organisation thereby becoming ‘THE’ bodybuilding organisation that all the athletes wanted to be a part of for the remainder of the century. 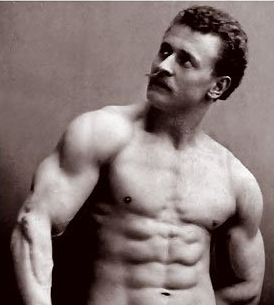 From the 1960s onward, the IFBB became a monopoly that few dared to challenge. It came as a surprise then when Vince McMahon, a man associated more with pro-wrestling than bodybuilding, sought to overthrow the Weider’s in the early 1990s and establish his own bodybuilding federation, labelled the World Bodybuilding Federation. Whilst the WBF only lasted for two years, it diveded the bodybuilding community, bringing in reforms of varying success and making the sport somewhat more mainstream. Chances are you’ve encountered the Body Mass Index (‘BMI’) at some point in your life. The measurement has become increasingly common as a health indicator and as we’re increasingly warned about the obesity epidemic sweeping parts of the globe, it’s nigh on impossible to ignore the statistics centring on BMI. So what is the BMI? When was it invented and what exactly does it measure? Much historical study has been conducted into addressing the atrocities committed by the Nazi Regime from 1933 to 1945. However, considerably less attention has been dedicated to the Nazi anti-tobacco campaign, a relatively benign government policy, which importantly, was one of the first campaigns by a Western government designed to deal with health issues arising from tobacco use. This subject is particularly topical in the current climate, as many Western governments are attempting to reduce tobacco use among their own citizens. This paper will examine the first mass Western government campaign against tobacco and its ultimate failings. Why were the Nazis so concerned to control the use of tobacco among its citizens? Is it possible that the Nazis were concerned with the wellbeing of some of its citizens? Or were more selfish motives involved?